Is it? Well the guys at the front make it look easy, how do they do that? 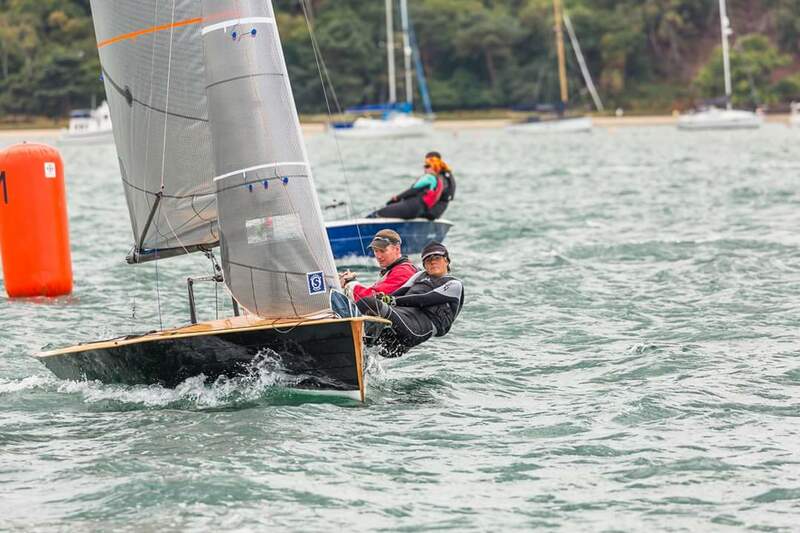 Parkstone yacht club held the Merlin Rocket silver tiller last weekend, a conversation over a beer at Cowes week led me to ask my brother to helm a Merlin for my ex. crew Matt, so we could grudge match, John an experienced dayboat helm ( ok, he’s won Cowes week a couple of times) but hasn’t been in a dinghy for maybe a decade agreed to this foolish beer talk. 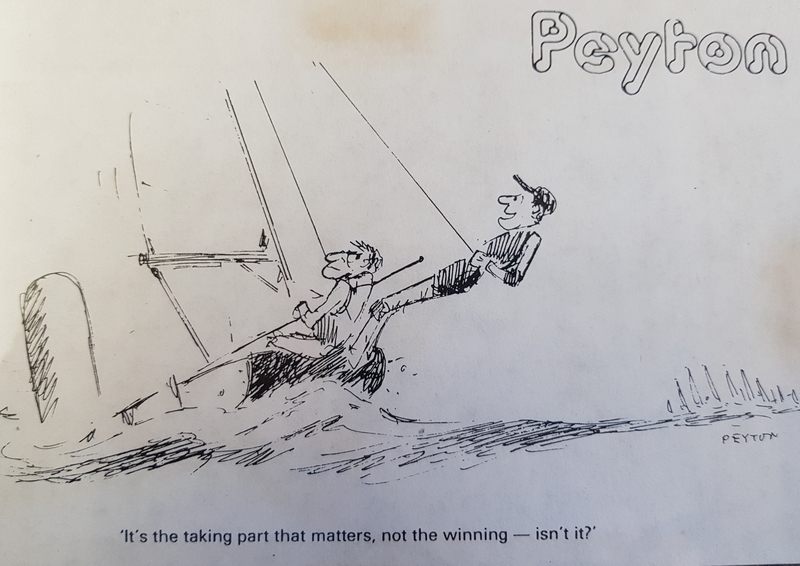 At the same beer talk I asked a mutual friend to crew for me (a Parkstone Yacht Club local), Christina, also an experienced dayboat and yacht crew (some people say professional, we just know she’s a Cowes week winning helm as well) but still a novice crewing in a Merlin. Two virgin crews, and a light forecast. Game on. Saturday dawned bright with sunshine and…… Zero wind. This gave the crews ample time to rig, fiddle, tweak, admire the plastic boats. Yes you guessed, we were two woodies. The hoisting of the new jib in dimension polyant flex, saw admiring glances from messrs Turner, Parslow and Birrell. Likewise lots of admiration of Jon Turner’s panther, amazing finish, and some very cool systems to control everything! Launching as soon as we could to allow a chance for some crew practise we made our way out to the race course. When arriving at the race area, give yourself enough time to sail the first beat, get a feel for the wind, tide, which side is favoured. This we did, the boat felt ok, the tacking and gybing as expected were not going to be on an RYA how to track a Merlin video. The fleet gathered, AP came down (that’s the red and white cat in a hat pennant, meaning racing postponed). The course was triangle, sausage X 4. That’s not a food order, that’s beat, reach (GYBE) reach, beat, run x4 laps. As the clock ticked down we found ourselves in the place you definitively do not want to be, a school boy error supreme. The start. Work out which end is preferred, work out a strategy to get there, find a space, protect your space, watch for boats trying to lever you up, give yourself room to power of the line. The start. Do Not Ever, ever, ever. Try to sneak in the committee boat end when the line is short, the tide is pushing you into the committee boat, there is the majority of the fleet at the committee boat, you have so many boats overlapped on you. And so we found ourselves at the committee boat with 5 seconds to go and no where to go. Crikey this was embarrassing, locked out at the committee boat end, we bailed out and gybed round to get back to the line as the fleet started. DFL (there’s a three letter acronym that sailors don’t like). Starting last in a fleet with world, national and olympians in wind of less than 10 knots is a bummer. Focus, watch the shifts, we were catching. The trouble is this fleet is good and most have been trying to win open meetings in Merlin’s for a while. By the end of the first beat we had caught the tail end, but the leaders were already approaching the gybe mark. Team work. Boat speed is great, boat speed is necessary to win. You will not win if you are not a crew, why do you think these guys sail together as much as possible? Practise, practise, practise. Practise so much that it really is second nature, two as one. The systems on a Merlin can be complicated, even when they make sailing the boat easier it still takes time to work out the best method. We struggled to get the kite up, we struggled with our gybes. We just couldn’t get downhill as quick as the others. A skewed gybe mark saw a gain from sailing a more direct line. A couple of places at the the gybe mark and the next beat. Learn from your mistakes. Simple, if you lose going right on the first and the leaders are going right. Then go right. The tide was making the left pay so we went left, quick in a straight line, manoeuvres and the downwind legs were losing the time for us. Thankfully the Race Officer shortened the course after the sausage. Not my greatest result in a boat, lots of reminders of doing the basics right. Despite waiting for the wind and wishing for wind, it never arrived and so AP over A was flown, that’s racing abandoned for the day, go and have a beer, try and work out why the top guys are so damn quick. Sunday. Race 2 (3, 4 &5) well the all sort of blurred together. The start, oh yes, this was better. Time, distance, gun…. Err speed? Where was the speed? Ummmm I dunno, we pulled the trigger and watched the fleet sail away! Nuts! Ok, ok, keep calm, shifts. Boat flat. We gained, we overtook, we lost a few. Every tack these guys did they were taking boat lengths from us. Amazing to see how much difference a well tacked Merlin gains over one just being ‘tacked’. We weren’t helped by my non slip deck being more ‘slip’ than ‘non’. More than once I tacked, the boat tacked, but Christina couldn’t find traction under foot and ended up folding back into the space whence she came, funny but not fast. Downwind the same story. I just couldn’t get the boat to go, not just boat handling, something just wasn’t ‘zinging’ downwind is usually a strong point. But we just bled positions. Gaining upwind is no bad thing, we just didn’t have the time and the downwind was losing more than we could claw back. Another shortened course and a whopper wind shift saw a pause. Our best start yet, hit the line with pace, boat speed good. We are looking ok, with the top guns, we are holding our line and our position. Wait for the shift, look for a lane. You’ve got to look for a clear lane to sail in, get some clean wind in your sails, as clean as you can find, don’t hit the extreme lanes unless you know you are into a 100% winning strategy, be aware of what the other guys might do, will they tack with you, if port starboard are you waving them on? The first shift came we tacked and and so did the boat above and then the one just behind. Not finding a lane of the start, another school boy error. Bugger, no we were being gassed by bad wind, we started to slip back. A clearing tack for a better lane and we rounded the top mark just outside the top ten. That’ll do, we can do it. The boat she works, she just needs time. Needless to say the downwind leg saw us lose a couple of boats, bit worse was to come. At the leeward mark we couldn’t get the kite into the chute, held in, half out. Turning the mark with the kite stuck we had to turn back downwind to try to rehoist the kite and have another go at getting it down…DFL. hmmmm. We got a few places back but the fleet had long since disappeared over the horizon. That is pretty much the story of this open meeting for us. 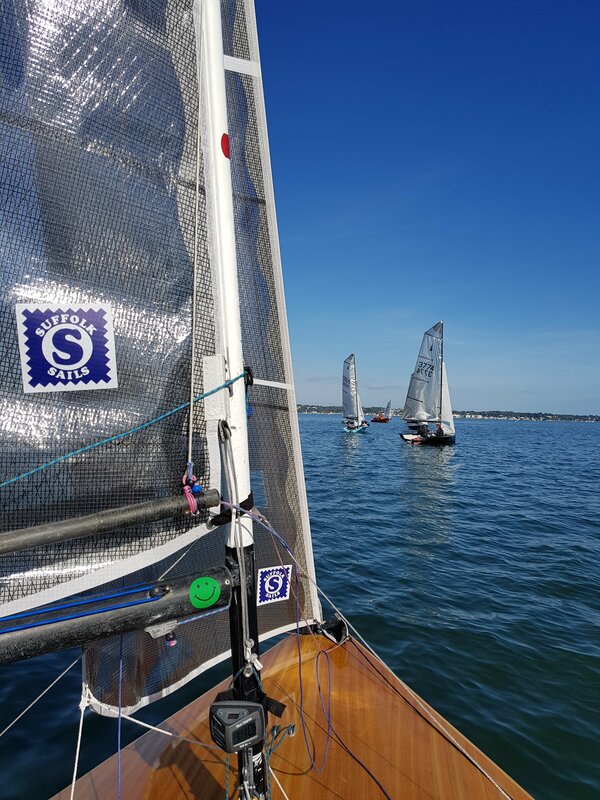 The starts got better, the upwind was good, but jumping into a boat as an untried team, when one of you hasn’t sailed a dinghy for a long time is not easy. Merlin’s are at the pinnacle of rig, foil, sail systems. However, in phases we felt good, the speed was there. So we’ll be back, it’s a drug sail racing and they say Merlin’s are a drug to, to get them working is addictive, is there a Merlin’s Anonymous? We think we might be getting addicted. Prior Planning and Preparation, Prevents Piss Poor Performance. If you are going to race successfully make sure your boat works, make sure the fittings are working, give them a tickle of silicone. Winning is easy, it just takes, time, dedication, the 7p’s. Maybe the other guys are better, maybe they practise more, maybe they have been doing it longer. Anyone can win. Can’t they? A huge thanks to my guest crew Christina, always smiling even when folded down to leeward. The non slip is ordered! Also thanks to Parkstone YC stunning location and clubhouse, friendly people, we’ll be back.. Sorry Matt, at least we have proved that we both need practise. Open results? Yes there are, they’re out there somewhere, it’s not about the winning is it?